SimpleTrackMD - Digital Wander, Inc.
SimpleTrack™MD is a simple and easy to use patient tracking application for the hospital based practicing physician. Designed by physicians for physicians, the entire app resides on one screen for one handed operation. Key features include adding a list of patients, billing codes/activities, taking a face sheet (photo) and saving an audio note. Records of patient visits are sent via email with secure SSL links for downloads. HIPAA and HITECH compliant with all secure connections between the app and our servers and full encryption of your data on your device. 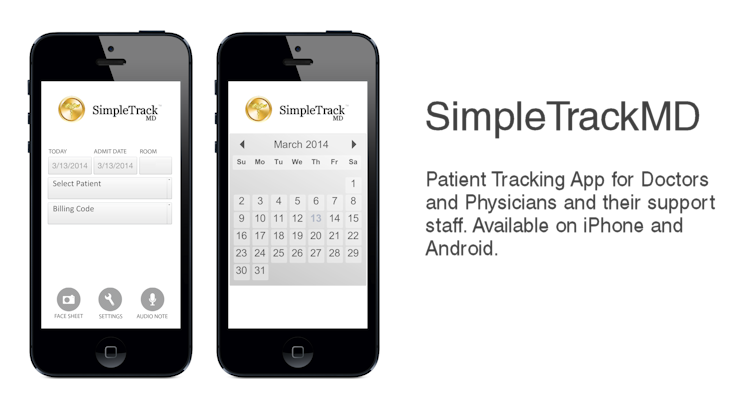 We hope you find SimpleTrack™MD useful for your daily patient tracking needs. This entry was posted in Android, eHealth and HIPPA compliant, iPhone/iPad, Provisional Patent Draft and Filing by digitalwander. Bookmark the permalink.